Andrew Marr’s Sunday AM programme on BBC1 this morning had a feature on political blogging, and the 20 seconds or so about a Labour blogger was none other than Harriet Harman. The header of her blog that I designed managed to get a quick view on national television. Quite cool! 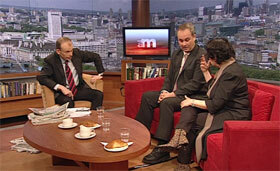 Unfortunately the panel that followed about blogging was with Iain Dale and Yasmin Alibhai-Brown. Dale is completely full of himself, although he does well understand political blogging. Alibhai-Brown on the other hand just seemed to want to have a rant about the whole thing. Overall it was a goos showcase of Harriet’s blog, and interesting that these matters are discussed on national TV. Let’s just hope for some more insightful analysis next time! It wasn’t too hard for you to out-shine Yasmin on the panel, but you are a bit smug with it. Harriet did come across very well in the short piece. You’re welcome to send her an invitation to appear on Blogger TV – e-mail is campaign(at)harrietharman.org I would personally be happy to appear on it too. Well, full of myself or not, I actually thought Ms H came across very well on the film and showed an understanding I thought she wouldn’t have. Perhaps I should have her on my Blogger Tv programme! In fact, let’s go one better and have you on too. What do you say?